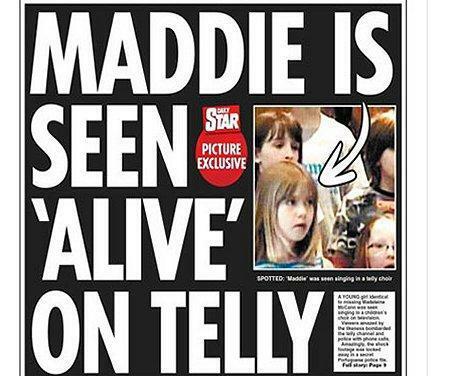 Madeleine McCann: an at-a-glance round-up of stories about the missing child in today’s media. The website Mama Mia has “6 unanswered questions we have after watching The Disappearance of Madeleine McCann“. Tosh. There is only one question, and it’s unchanged since the child banished in 2007: what happened? The Netflix show shed light only on itself. Possibly. On planet Maddie, a possibility – a thing without proof – is an exclusive. We meet Dr Mark Perlin, “one of the leading DNA scientists in the world”. He’s not worked on the case. He says “modern methods” are best. 9News is all in, chiming: “Dr Perlin’s powerful DNA testing software, widely regarded as the most sophisticated on the planet, is a quantum leap ahead of the forensic science used in 2007, when the McCann samples were tested.” Regarded by whom? And why is Dr Perlin in the news? Answer: “Nine.com.au sent [Perlin] a copy of the FSS [the Forensic Science Service] DNA report which was handed to Portuguese police in September 2007.” Nine then interviewed Dr Whatshisface in the fifth episode of Maddie, “Nine.com.au‘s podcast investigation into Madeleine’s disappearance”. Dr Perlin has a company that he says could look at any DNA and maybe – maybe – crack the case. Or not. Possibly. It can happen? But did it happen? One man’s guess is not as good as another man’s guess. But we need an end to the story. Discuss in the form of an eight-part documentary or podcast.